Several members of QAI’s technical, quality and policy teams attended the annual Accredited Certifiers Association (ACA) Meeting and NOP Training held in San Antonio, Texas, February 6 – 8, 2018. The focus of the one-day NOP training was largely on verifying organic imports. If your operation is importing organic goods, or working with a non-certified broker importing goods for you, you will want to make sure that you are maintaining the necessary documentation to demonstrate compliance, including confirmation that the imported organic goods were not treated with a prohibited fumigant at the port of entry. Phytosanitary certificates and Emergency Action Notifications must be maintained and made available for review during on-site inspections, as applicable. The themes of the ACA Training were traceability in the supply chain and international issues. There is growing emphasis on verifying organic integrity through in-depth review of audit trail systems, and mass balance exercises. This is critical when verifying the organic integrity of imports. 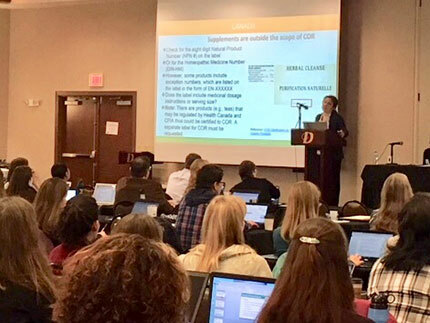 QAI’s very own Mabell Rivas provided an in-depth presentation on international requirements for organic product labeling. QAI appreciates our partnership with the Accredited Certifiers Association and looks forward to the next meeting!